Significant growth in demand for mining commodities has outstripped the ability of producers to increase supply to the market, creating an imbalance that has pushed commodity prices to historically high levels, with resulting windfall profits for producers. Accely collaborates with mining companies to create and execute innovative strategies that combine people, process and technology to achieve high performance—today and tomorrow. 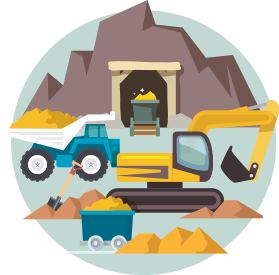 The Accely Advanced Enterprise Solution for Mining is an innovative, comprehensive and proven enterprise resource planning solution based on SAP platform that accelerates enterprise-wide business value for high performance. The solution built on SAP’s best-practices template, our preconfigured solution – coupled with Accely building blocks links industry-leading processes to a preconfigured solution built on the latest technology and is packaged with complete process documentation and industrialized implementation accelerators - provides predictable outcomes.